The Young Artists Series is a brand new program that promises to be one of The Stage’s most promising to date. With the success and feedback of all of our art integrated programs like Spring & Summer and Pro-D Day camps we were inspired to create a series to encourage young artists to enjoy all types of arts outlets in a year long program. Preschool aged students (3-5) will enjoy mornings filled with Music, Dance, or Acting as well as a visual arts component each day. 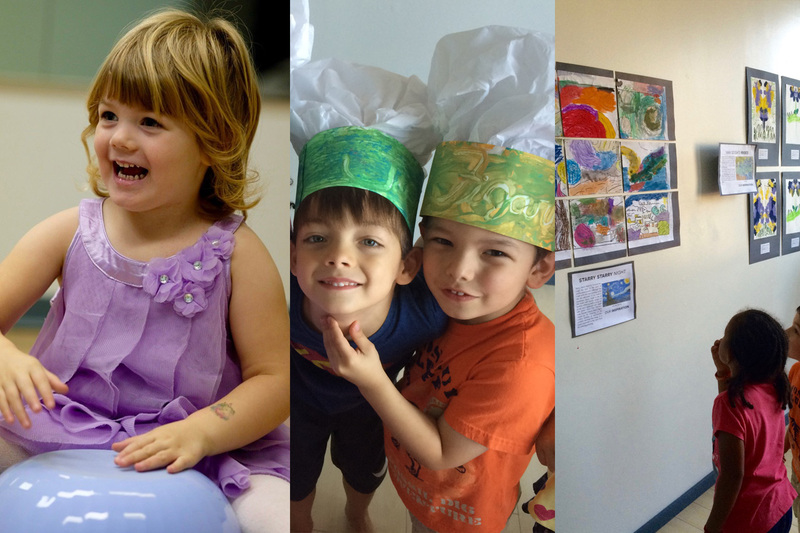 Depending on which day of the week you choose your child may receive an hour long music program (our popular Preschool Music Adventurers program), an hour long Creative Dance program or an hour long Preschool Theatre program accompanied by a visual arts activity that explores our themes and artists from many different historical eras. We will also enjoy “Adventure Arts” like collage, sculpture, tinker trays and more! All of this activity is photographed and shared in a private, secure, current parents only, Facebook group where you can access pictures and our weekly diary of events. With this program located at our brand new River Market studio, students will also have an opportunity to play outdoors and take nature walks down the boardwalk. As this program grows we are excited to offer components like culinary and literary arts. With so many River Market neighbours working as professional artists in culinary, floral arranging, architecture and design we have at our fingertips the opportunity to make connections with community members that could support our exploration in these fields. We are also pleased to offer parents a great amount of flexibility. Our program will operate on a month to month basis. You can choose which day of the week works best for you, and your minimum obligation is 1 month. You can choose as many days a week as you like allowing you to cater your child’s schedule to their interests. If working on a month to month basis you can sign up for the next month any time. Book as many months in a row as you like, or take it month to month based on your schedule. The curriculum will run as a year long program. This means that each month you register for will continue to move forward and not repeat the themes of the previous month. This is ensures that any students who decide to take a full year of programming will enjoy an endless variety of activities, and students who enjoy this program month to month won’t have to worry about repeating a month of curriculum when they return. You can sign up for a month at a time, or numerous months at a time. Monthly spots will be on a first come first served basis so don’t hesitate to get on our waitlist! -Students must be fairly self sufficient with using the toilet at the start of their program. We cannot accept students who are still using diapers or trainers. Assistance in the bathroom will consist of helping your child on to/off of the toilet, clothing help and hand washing. -Students should come prepared for outdoor play every day, even if the weather is cooler. As long as there isn’t a torrential downpour or blizzard we try and get outside for part of the morning. If the weather is too terrible to play outside we opt for indoor activities. -Students should also be prepared to get a little messy in art. Please wear clothing that you don’t mind getting paint on! **Minimum registration is 1 month which will be 3-5 classes a month depending on the calendar and statutory holidays.